Kid3 (http://kid3.sourceforge.net/) looked interesting if nothing else for being multi-platform OSS (meaning various Linux flavors, including Android, MacOS and Windows) and by its broad format coverage; but like most Qt based software this days, it proved neither portable nor stealth -- settings are saved to 'HKCU\Software\Kid3', 'HKCU\Software\kid3.sourceforge.net' and 'HKCU\Software\QtProject'. http://kid3.sourceforge.net/ wrote: If you want to easily tag multiple MP3, Ogg/Vorbis, FLAC, MPC, MP4/AAC, MP2, Opus, Speex, TrueAudio, WavPack, WMA, WAV and AIFF files (e.g. full albums) without typing the same information again and again and have control over both ID3v1 and ID3v2 tags, then Kid3 is the program you are looking for. The latest Kid3 release (currently v3.4.0) can be downloaded from http://kid3.sourceforge.net/#download. You can set KID3_CONFIG_FILE in your user or system environment variable settings. C:\Windows\System32\cmd.exe /c "set KID3_CONFIG_FILE=kid3.ini&start kid3.exe"
Then you may want to change the icon to kid3.exe and set a minimized start. I'd favor the second method (batch) but for good form I would prefer to use 'SETLOCAL' instead of 'SET' (for an explanation, please see http://ss64.com/nt/setlocal.html; moreover, for an explanation of the meaning of "%*" in the third line, check http://www.robvanderwoude.com/parameters.php#NT). I haven't tested this but I'll go ahead and bump this over to Submissions. I have tested Kid3 version git20161121- when I start it with kid3.exe --portable parameter the program creates an INI file (kid3.ini) in program folder. I think that this method to run Kid3 in portable mode is easier and handier than via a batch file. Thanks to webfork for opening the issue and to the developer for paying attention to users' requests, implementing an easy way to run Kid3 as a portable program. Notes: This bugfix release fixes the import of durations when importing from file or clipboard, and building with Chromaprint 1.4. New features include a portable mode storing the configuration file in the application folder, copying of images to the clipboard and an MPRIS D-Bus interface for the audio player on Linux. + If the first command line argument is "--portable", the configuration is stored in a file kid3.ini in the program folder. + Image data can be copied to clipboard. 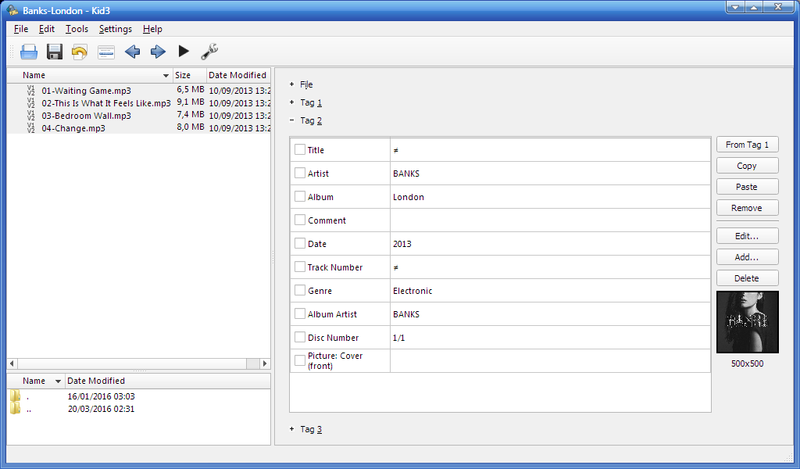 + MPRIS2 D-Bus interface for the audio player. + "Import CSV" can import to different files if no matching file paths found. + Importing of durations from text formats (file/clipboard). + Building with Chromaprint 1.4.
option. To celebrate the first Kid3 stable version (3.4.4) which supports this parameter I added Kid3 to the database. Sure thing Thanks for posting that. + Settings to include and exclude folders in the file list. + Use HTTPS for imports where possible. + Reduced memory usage when filtering. + Updated Czech and Dutch translations. + Rate limit for import from Discogs. + Do not display multiple frames of same type as different. filtering a huge number of files. selecting a lot of files, is now abortable. + Terminate kid3-cli if EOF is received. MusicBrainz Picard at version 1.4- from the 1.4 I can see that there lots of improvements but I cannot stand the new icon and logo so version 1.3.2 will be the last one for me. For me the new modern one looks terribly ugly and is absolutely unbearable. Modern flat ugliness is everywhere. FTR, I'm still getting traces in the registry after running Kid3 with the portable parameter -- there's an empty key at 'HKCU\Software\kid3.sourceforge.net'. Are you sure that the registry key you mentioned wasn't created by a version of Kid3 when the program was not yet portable? and these version didn't create registry keys (under Windows 8 x64). You may delete the key, run the latest version of Kid3 with the portable parameter and check if the key is re-created. I re-checked the registry and didn't find that key. Already did. Didn't recheck, though. Nothing there.